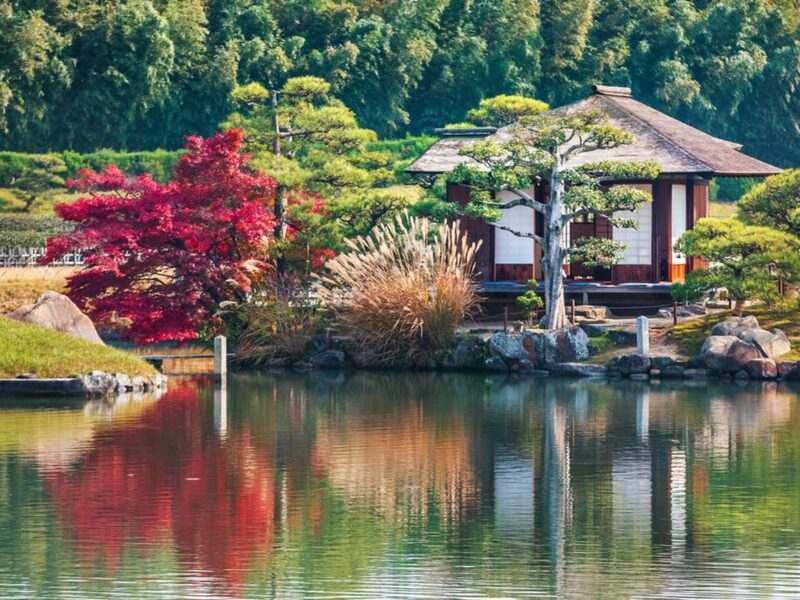 Famous for its abundant sunshine, gorgeous gardens, and its association with the legend of Momotaro, Okayama Prefecture is the perfect place for a relaxing weekend immersed in nature. If you can head down during the autumn, all the better: Okayama is home to some of the most beautiful foliage viewing spots in Japan. Just 45 minutes by bullet train from Shin-Osaka Station, Okayama is convenient, close and unquestionably one of Honshu’s best kept secrets. 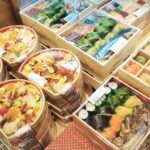 It’s never too early to start planning so here is a short list of things to add to your Okayama bucket list! 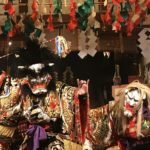 Only 25-minutes by train from Okayama Station, Kibitsu Shrine may well be the location most associated with the legend of Momotaro. If your timing is right, it’s also the perfect spot to start your autumn leaf-viewing journey. Kibitsu Shrine is a registered national treasure. Everyone in Japan is said to have heard the tale of Momotaro in which an elderly couple stumble upon a giant peach which opens and births a baby boy. The boy, Momotaro, grows up to become an oni (ogre) hunter and sets off to slay the ogres of Oni Island. With him, he brings a dog, a monkey and a pheasant and gives them each a kibi dango (mochi dumpling) in exchange for joining him. Together, they slay the ogres and rid Oni Island of evil. 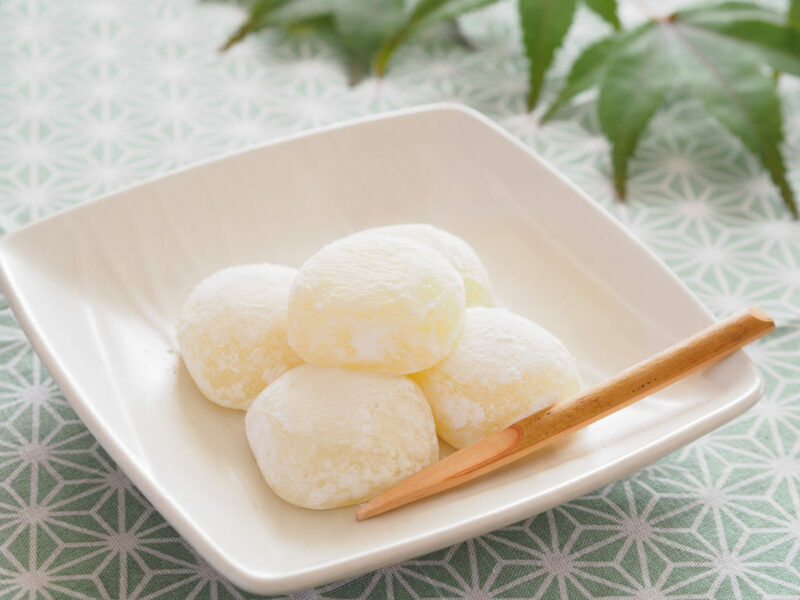 Many believe that kibi dango was first served in Kibitsu Shrine and, therefore, closely associate it with the legend. Kibidango is a popular omiyage from Okayama. 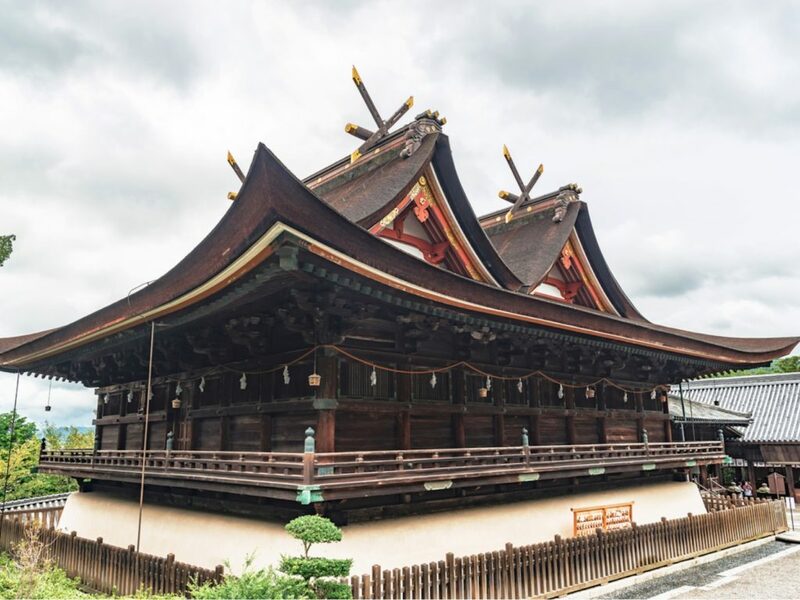 In addition to its enthralling history, the shrine itself is also an architectural marvel. Built in 1425, Kibitsu Shrine is a registered national treasure due to its age and the unique design of its double-peaked roof. 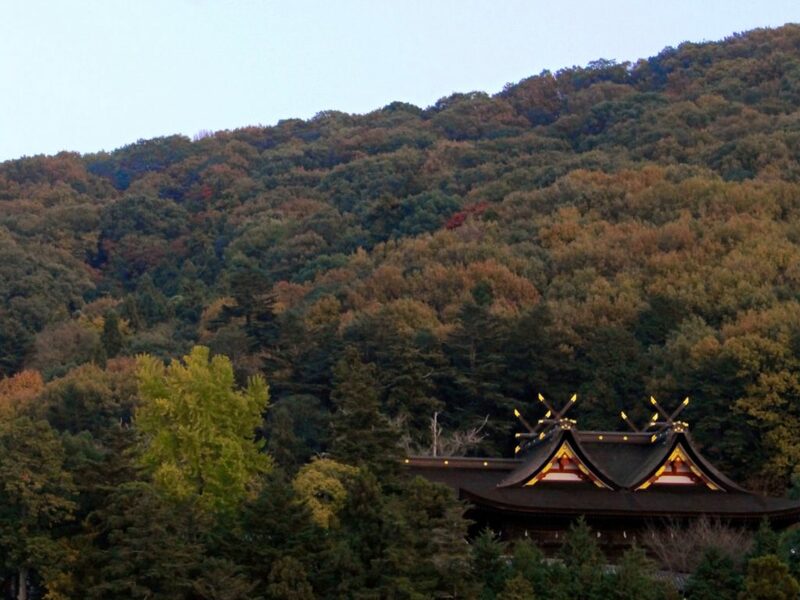 During late-October to November, the shrine is enveloped with breathtaking hues of red, orange and yellow foliage. 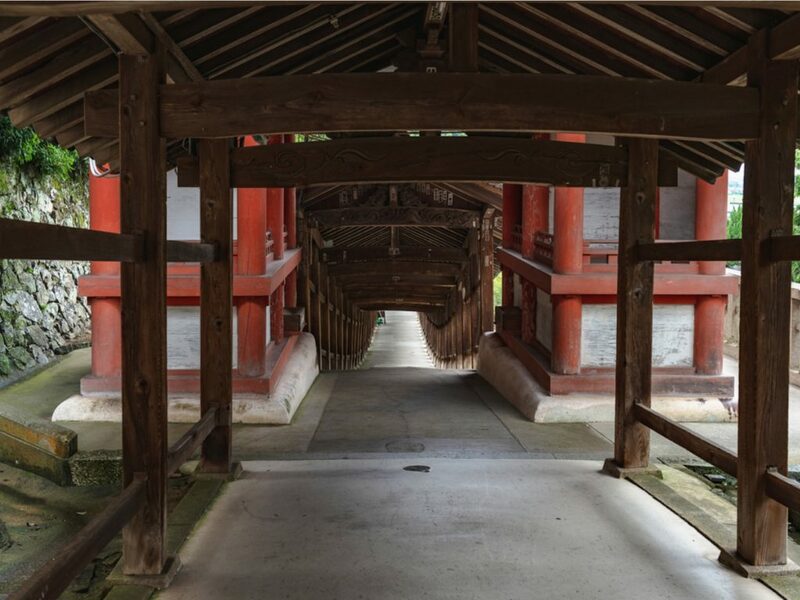 The wooden corridor of Kibitsu Shrine. Beside the entrance to the main shrine runs a 360-meter wooden, outdoor corridor which dips and rises at the soft incline of the hills. During the autumn, the corridor is the perfect place to take a stroll and view the scarlet foliage beyond. Kibitsu Shrine surrounded by autumn leaves. No trip to Okayama would be complete without visiting Korakuen Garden. Built in 1700, Korakuen is regarded as one of Japan’s three most beautiful gardens—a title also shared with Kanazawa’s Kenrokuen and Ibaraki’s Kairakuen. 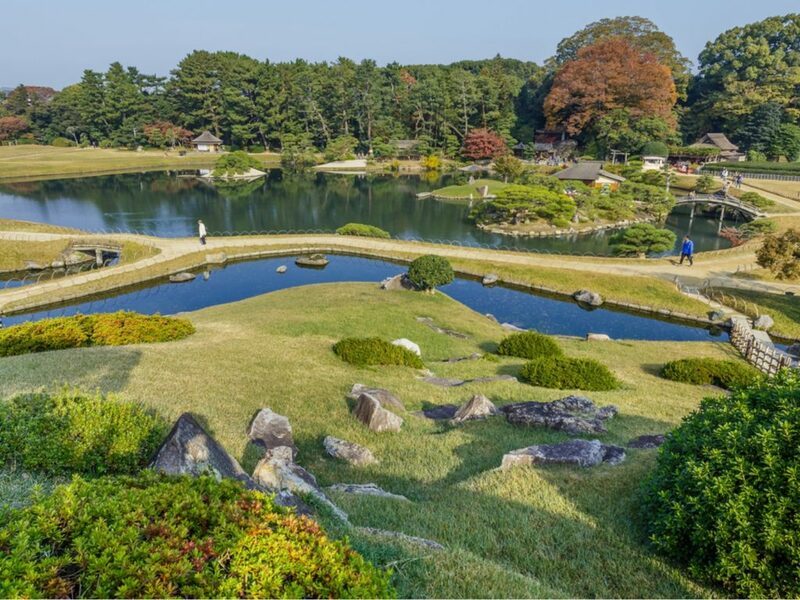 Korakuen is a kaiyu (scenic promenade)-style garden, carefully designed so that a different perspective is viewed from every point along the garden path. Although, Korakuen is worth a trip all year round—thanks to the plum blossoms of late winter, the cherry blossoms of spring and the iris blooms of mid-summer—autumn is the most beautiful time of all. This is mostly due to the hundreds of scarlet momiji (Japanese maples), the yellow gingkos, and the scattering of other deciduous trees in between. If you have time, pop into the teahouse beside the pond, take a moment to bask in the beauty of the foliage and have some hot matcha (powdered green tea) and wagashi (traditional Japanese sweets). In mid-late November, the park comes alive with night-time illuminations that transform it into an enchanting fantasy garden. The vibrant colors of the autumn leaves are painted red and yellow across the black canvas of the night sky. Even sections of the park without autumn leaves are decorated in illuminated traditional umbrellas, candlelit lanterns and Christmas-style lights. 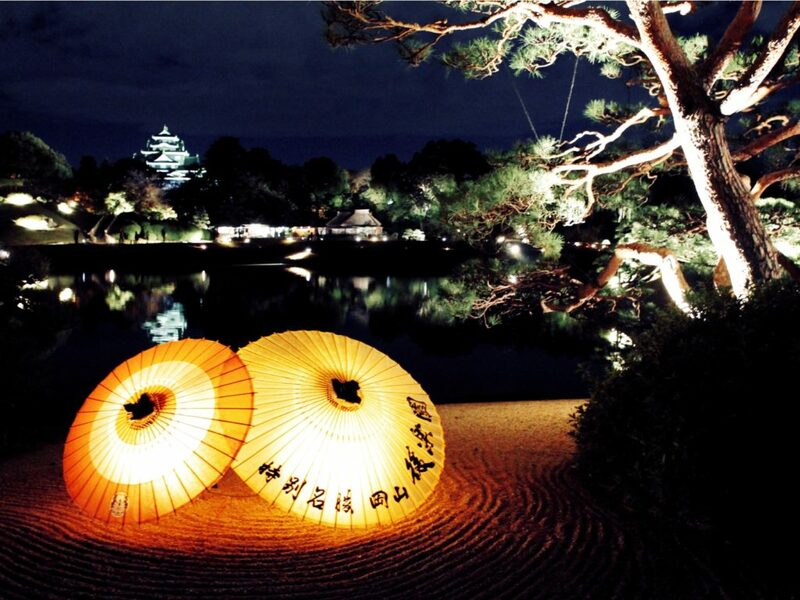 Korakuen is lit up at night from late April to early May, in August and again in late November every year. 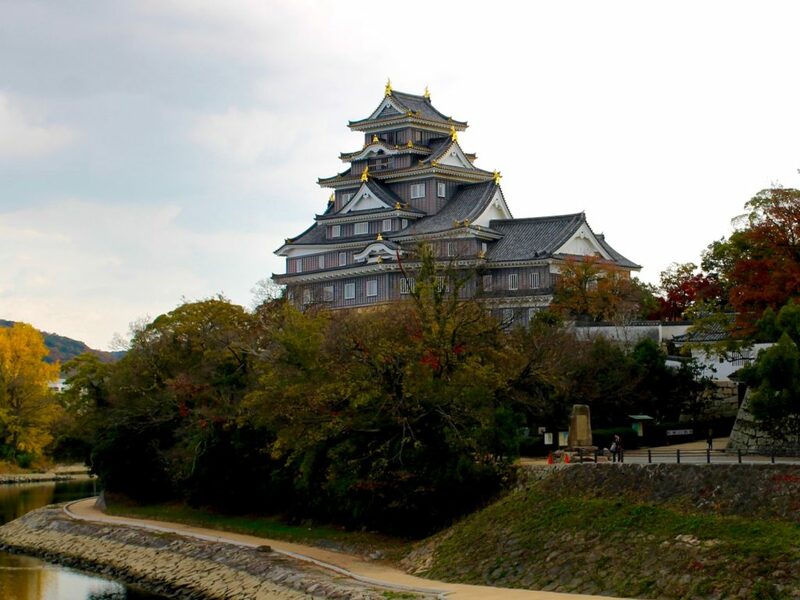 Once you’re done with the garden, head across the Asahi River to the grounds of Okayama Castle. The castle dates back to the 1500s, however, the current iteration was constructed in the 60s. Due to the building’s entirely black façade, it earned the nickname “crow castle” about 100 years ago. 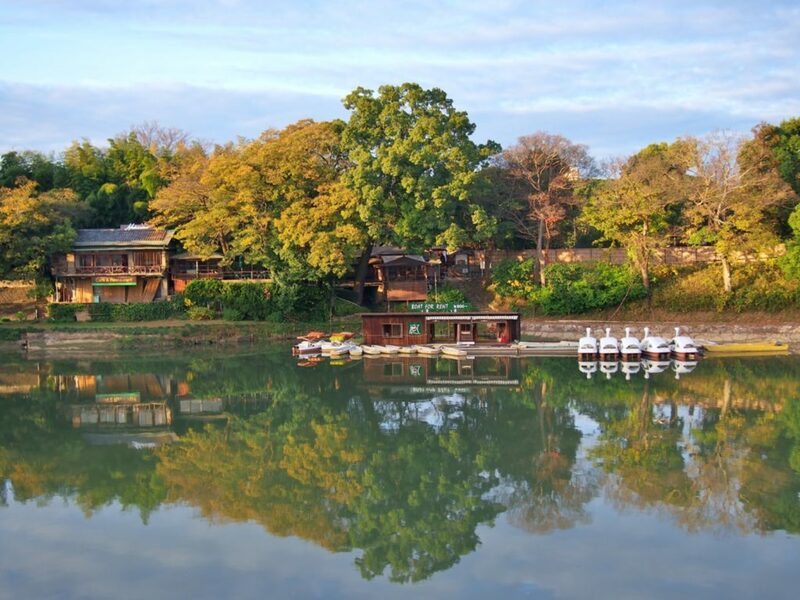 If the weather’s good you can explore Korakuen from a paddle boat. Now, the castle is a museum. It has six floors of artifacts, historical explanations, samurai armor, weaponry and a few fabulous places to take some Instagram snaps. 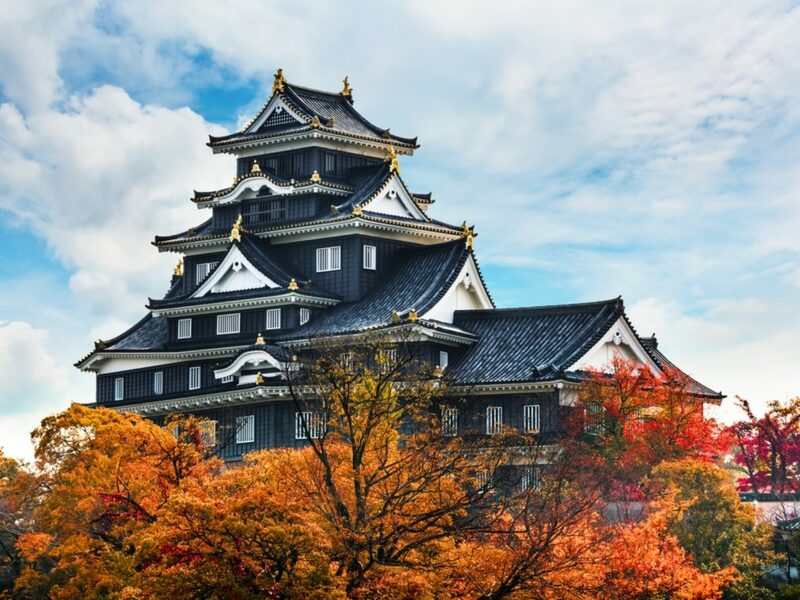 Just like Korakuen, the castle is enveloped in warm autumnal hues during the fall months. Plus, the autumn illuminations extend to the castle grounds. A joint ticket to both Korakuen Garden and Okayama Castle is available for ¥560. 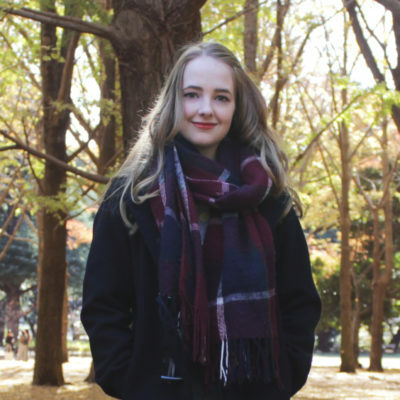 Although Korakuen Garden is boundlessly beautiful, it is also undeniably busy. 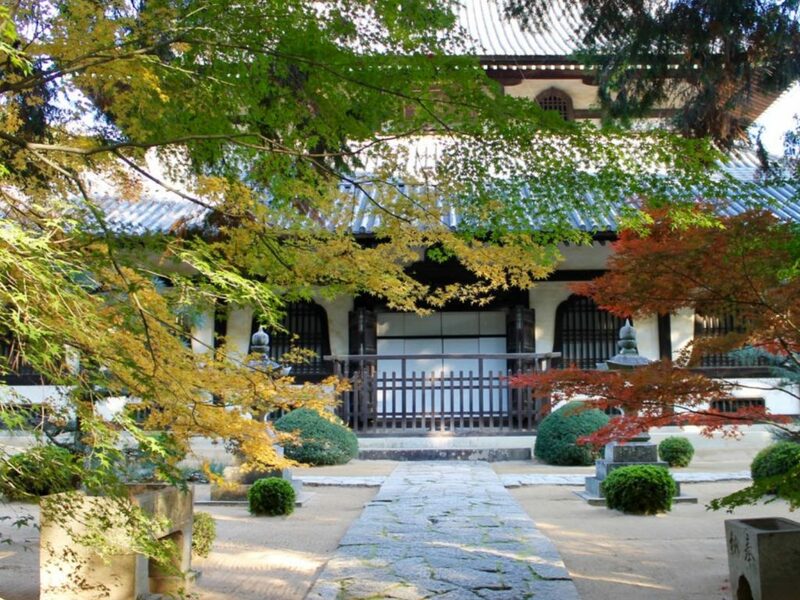 If you would rather a more serene leaf-viewing experience, head to Sogenji Temple. The grounds of Sogenji Temple. The temple is only a 25-minute bus ride from Okayama Station, and is an active monastery home to monks practicing Zen Buddhism. Sogenji is a tranquil hideaway, surrounded by Japanese maples and a plethora of stunning autumnal trees. Being a little out of the way, the temple is the perfect place to take a quiet stroll and meditate on the beauty of nature in peace. Sogenji can be reached via bus from Okayama Station. 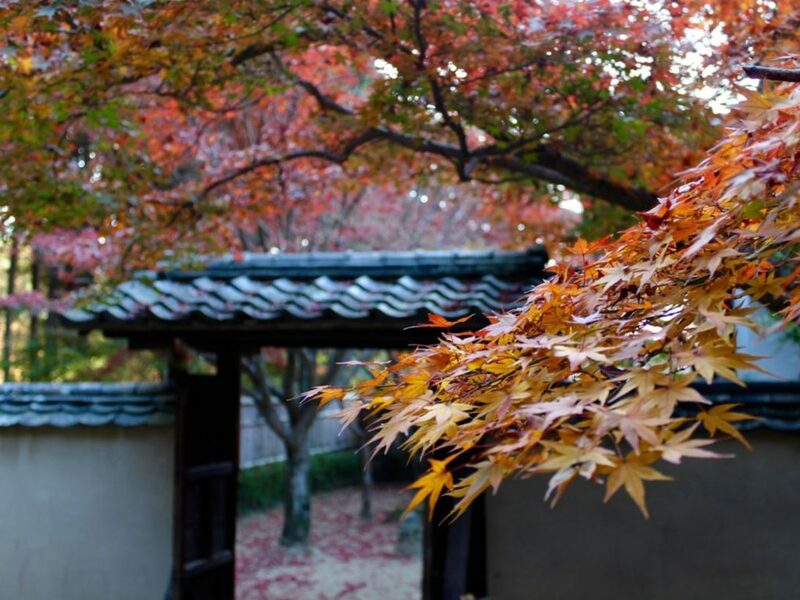 The autumn leaves at Sogenji Temple in Okayama. 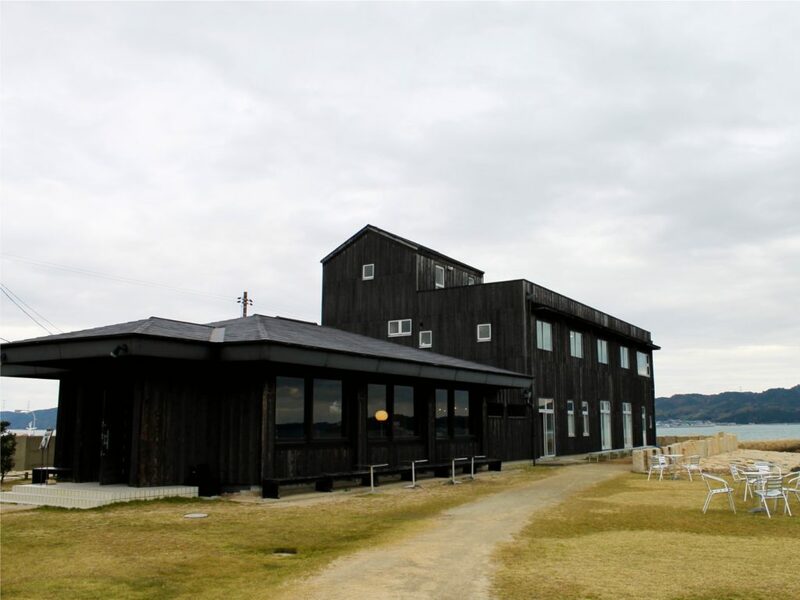 If after all that nature you’re looking for something a little more contemporary, why not head out to Inujima island? Although the island’s name literally translates to dog island, there are no fluffy friends here. What you will find is art. 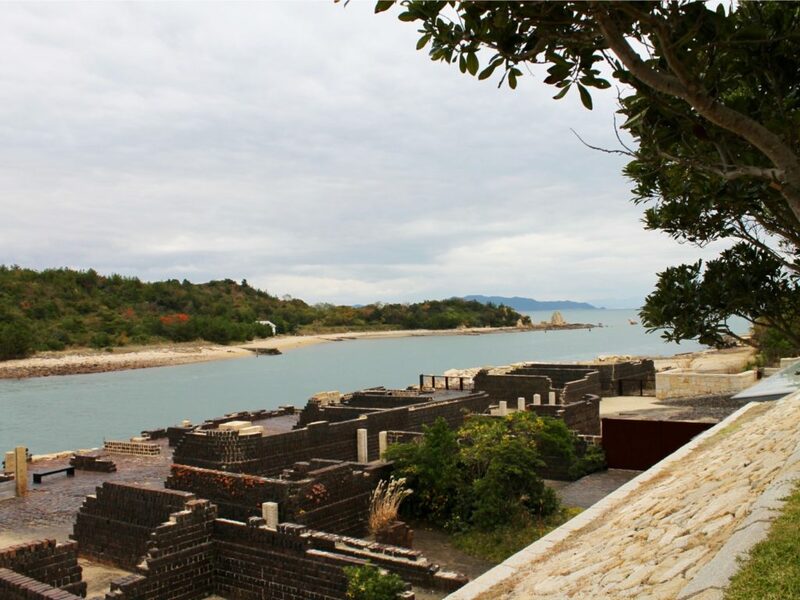 Inujima is a secluded island on the Seto Inland Sea, about an hour away from Okayama Station by ferry, bus and train. Here you can visit the Inujima Art House Project, which explores the integration of contemporary art into everyday spaces, as well as the Inujima Seirensho Art Museum. The Inujima Art House project features installations in the ruins of an old copper refinery. The museum was built in and around the ruins of an abandoned copper refinery and is full of intriguing surrealist installations. It’s safe to say that you’ve never had an art museum experience quite like this one. Once you’re tired out from exploring, sit back and turn your taste buds into tourists. Okayama is famous for its shimizu-hakuto (white peaches) as well as kibi dango. But, there are two more foods you’d better not miss. 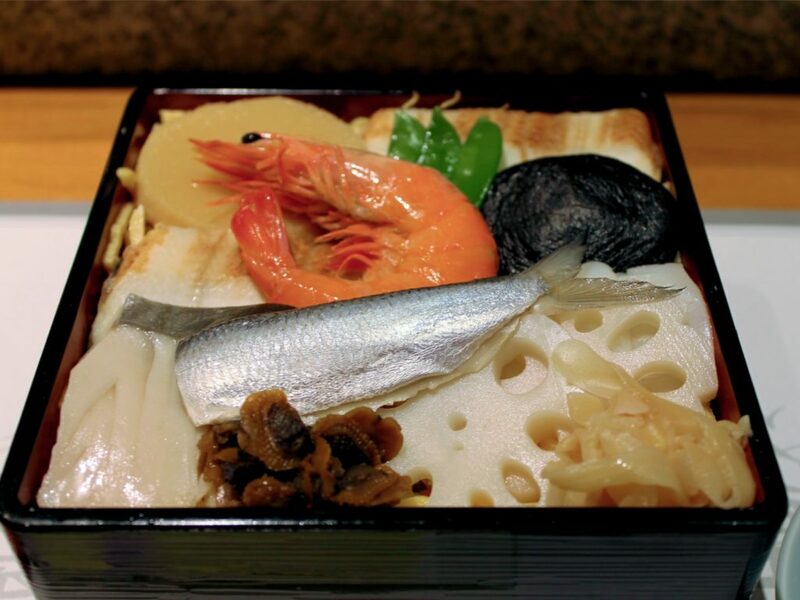 First is Okayama Barazushi, which has a history dating back to the Edo period when the daimyo (feudal lord) ordered that no one consume more than one soup bowl and one side plate per meal. Barazushi skirted this “thrift ordinance” by unconventionally piling rice with seafood, vegetables and shredded egg. Second is Demi-Katsudon. 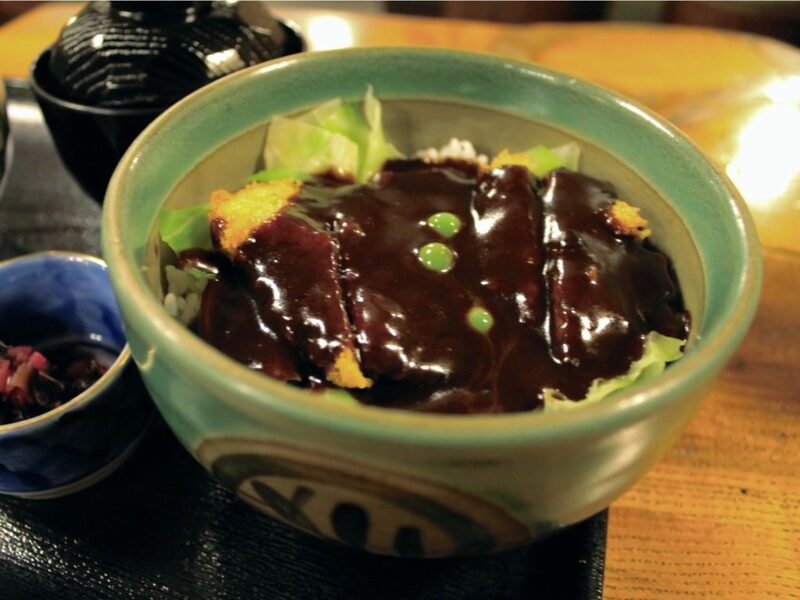 Similar to ordinary katsudon (a meal of breaded, fried pork on rice, topped with egg and onions), Demi-Katsudon consists of breaded pork on a bed of green cabbage, covered by “demi-glace”: a rich, creamy, brown sauce originating from France. The perfect way to end a day exploring a seasonal wonderland! Where have you visited in Okayama Prefecture? Let us know in the comments down below.